My placement took me down to the shore in Leith to Black & White Publishing. They are an independent publisher focusing predominantly on books with a Scottish interest. Their titles include both fiction and non-fiction and range from Young Adult to sports to true crime. During my time there I had the opportunity to work on a number of different projects. I compiled links of reviews for use, updated social media, contacted customers, processed orders and sent out review copies. These tasks provided me the chance to witness a number of the ways in which publishers connect with their target audience to promote their books. Having a keen interest in Editorial meant I was excited to hear that I would be able to read the unsolicited submissions that Black & White receive. Many publishers no longer accept these so it was a great opportunity to be able to do this! 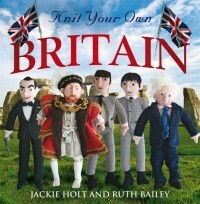 I was also given the chance to proofread one of their upcoming titles, Knit Your Own Britain, the follow up to last year’s Knit Your Own Scotland. This was very different to any proofreading that I have done before as it was mostly knitting patterns which proved challenging but was an excellent opportunity to test myself! Another exciting aspect for a book lover like me was that I was asked to read a number of upcoming books and I am really looking forward to seeing all of these projects when they are published later this year. My time at Black & White was a great chance to apply the skills that I have gained as part of my MSc and put them to use in a publishing environment. I would highly recommend a placement with them and thank you to the team for having me! If you want to find out more about Black & White Publishing you can visit their website, and follow them on Twitter and Facebook. Next Next post: Oh, really…?